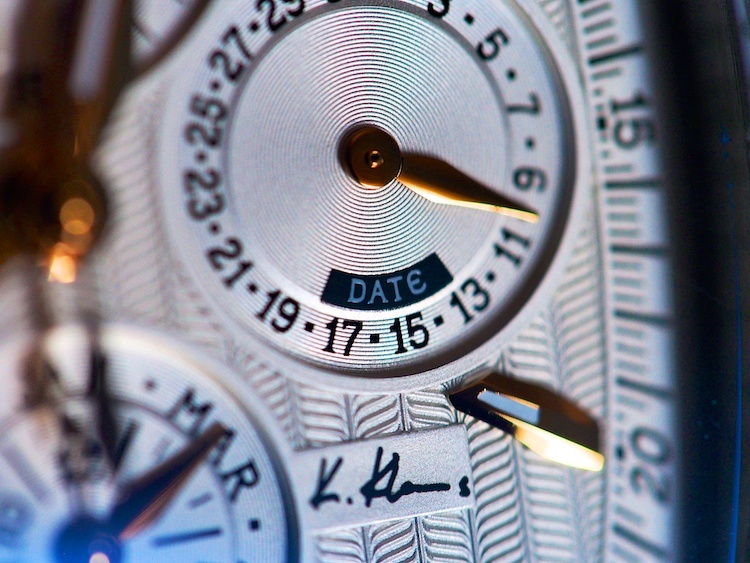 In 1985, IWC’s Kurt Klaus presented his latest invention at BaselWorld: The IWC “Da Vinci” Perpetual Calendar Chronograph, which went on to become one of the most justly famed perpetual calendars of all time. The Da Vinci Perpetual Chronograph included the world’s first perpetual calendar mechanism in which all indications could be adjusted without recourse to pushers or adjusters build into the case –instead, all the indications –day, date, month, year, and phase of the moon –were controlled by the switchover of the date at midnight. This also meant that all indications could be adjusted by pulling the crown out to its second position. Moving the date ahead one day would also advance all the other indications –the entire calendar mechanism was internally coordinated, including the phase of the moon, which was accurate to one day per 144 years. The Da Vinci was born from the fertile mind of IWC’s Kurt Klaus, who had joined IWC in 1957 and trained under its legendary technical director Albert Pellaton, who devised the elegantly simple and beautiful automatic winding system that still bears his name. 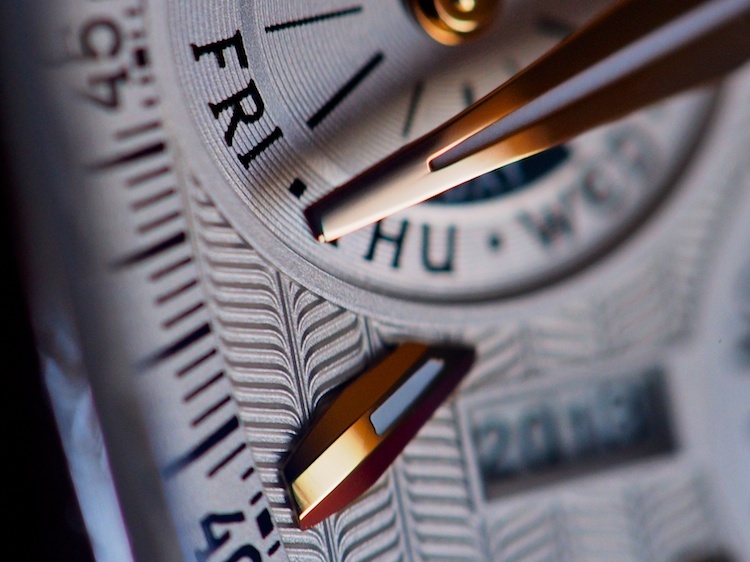 The development process of the perpetual calendar mechanism was an historic one for IWC for several reasons. 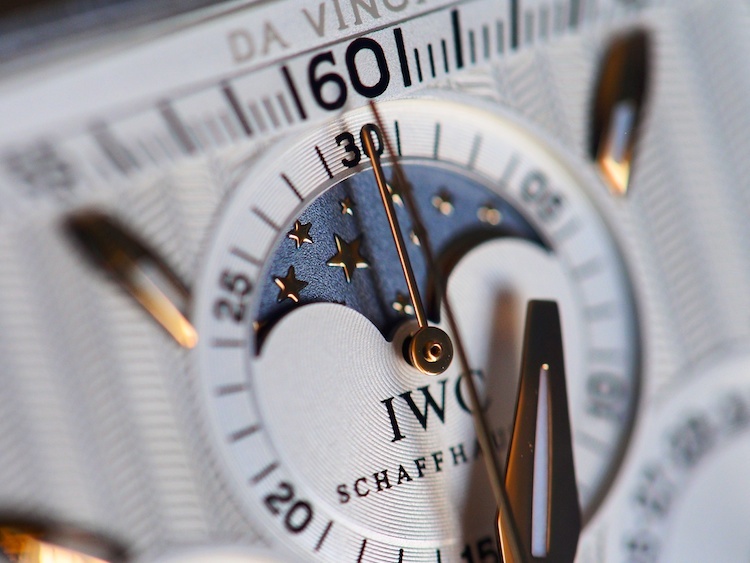 First, the resulting watch would be the most complicated wristwatch that IWC had ever made. Secondly, it would be the first perpetual calendar in which all indications would be coordinated internally (including the phase of the moon) and which could dispense with the complex pusher adjustment system that had until then characterized all perpetual calendars. 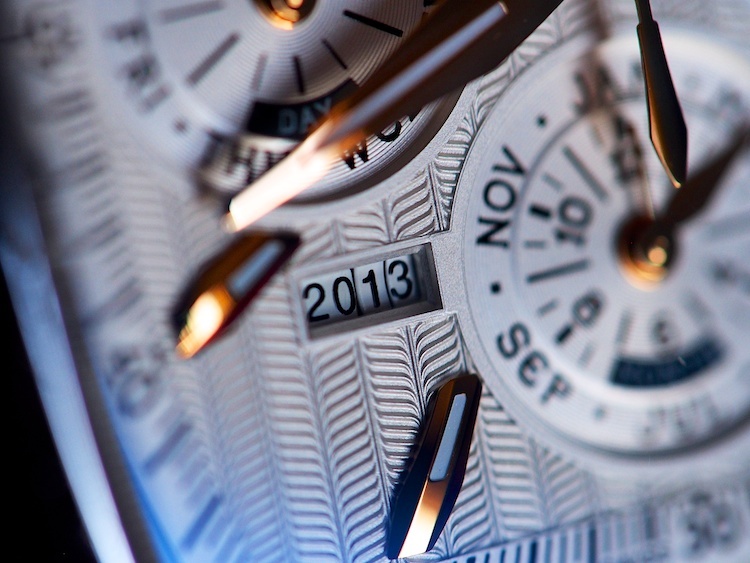 And finally, it would be the first perpetual calendar wristwatch to show the full four digit year. Finally, the entire mechanism was designed and laid out by Kurt Klaus using a slide rule, pencil and paper, and paper models of the movement –it would be the last movement designed “by hand” at IWC. From then on, CAD tools would become the standard. The watch was introduced in its original round, gold case in 1985 –it was a very close thing, as the final display disks (marked 0-9) were only finished the day before the show. Klaus drove to Grenchen from Schaffhausen, picked them up from the supplier, and installed them in the first three Da Vinci prototypes at his bench himself –they were ready only half an hour before the show opened. In 2009, the Da Vinci perpetual calendar returned but this time, paired with IWC’s calibre 89630. The new movement, known as the calibre 89800, is the current standard-bearer for the Da Vinci Perpetual Calendar Chronograph legacy; it’s the Da Vinci Perpetual Calendar Date Month, which shows the date and the month in two large, two-digit, instantaneously jumping digital displays. It’s an extremely legible watch –more so than its predecessor, and has the added attraction of having both a module and base calibre made in-house by IWC. It omits, however, two of the essential elements of the original Da Vinci from 1985 –the moonphase display is gone, and so is –alas! –the four digit display of the year. The original Da Vinci like most perpetual calendars will need adjustment at the manufacturer in 2100 (thanks to a peculiarity of the Gregorian calendar; usually, every year that is exactly divisible by four is a leap year except for years that are exactly divisible by 100.) At that point, the watchmaker may also install a little “century slide” that came in a glass tube with the original Da Vinci, which carries the numbers 2,3, and 4. This allows the watch to switch from 2100 to 2200, 2300, and 2400. One imagines that a few years prior to the year 2499 one would be well advised to apply to IWC for a slide with the numbers 5, etc. on them. 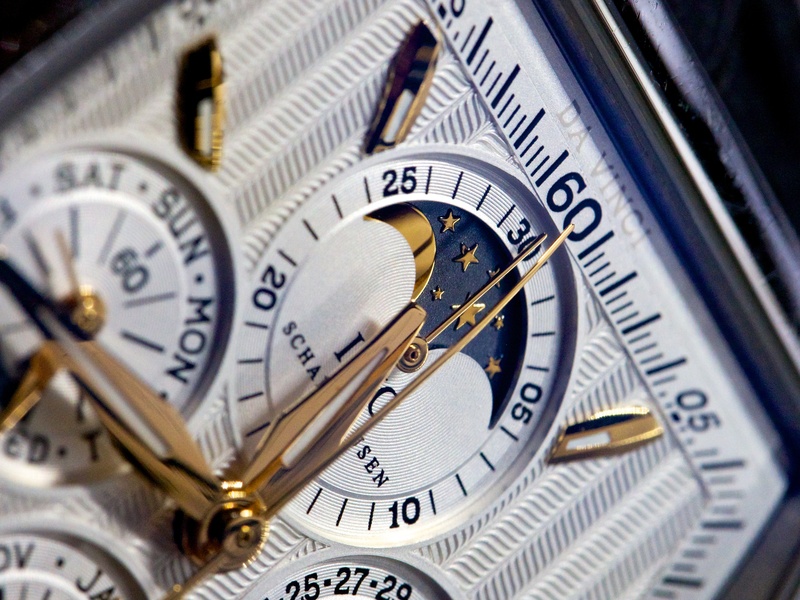 While the greater legibility of both the date and chronograph functions on the 2009 Da Vinci Digital Date Month are laudible, I can’t help but mourn for the loss of the synchronized moonphase –always a romantically and aesthetically desirable addition to a perpetual calendar and a reminder that at its heart the perpetual calendar is an astronomical complication (as the vagaries of the Gregorian Calendar are necessitated by the fact that the Earth’s orbit is not divisible by a whole number of days) –and especially the loss of the full year display. There is something about wearing half a thousand year’s timekeeping on one’s wrist that no amount of legibility can quite replace. Then again, I’m apt to sacrifice practicality for intellectual pleasure at the drop of a hat. Coda: the dial furniture (hands and markers) of the IWC Edition Kurt Klaus are lovely; the hands are designed to echo the shape of the nib of a fountain pen or goose quill pen. Immaculately executed. 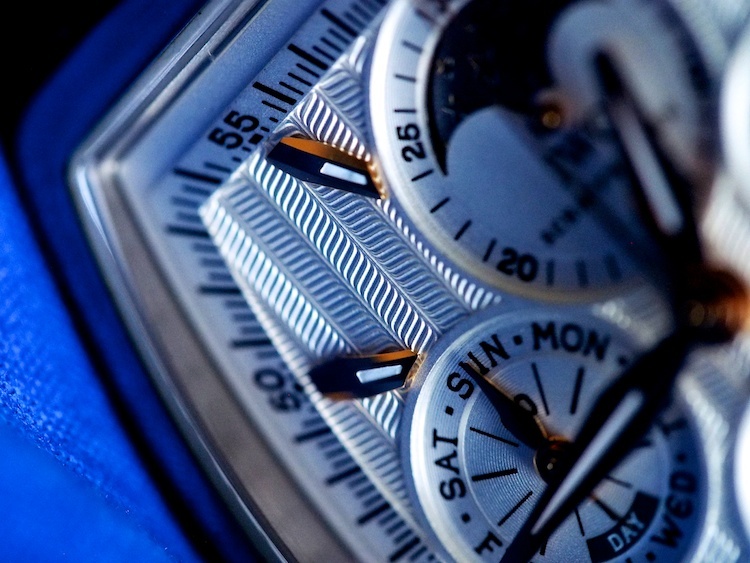 Hope you enjoyed this look at one of the most interesting final examples of one of the most important perpetual calendar movements in modern watchmaking. 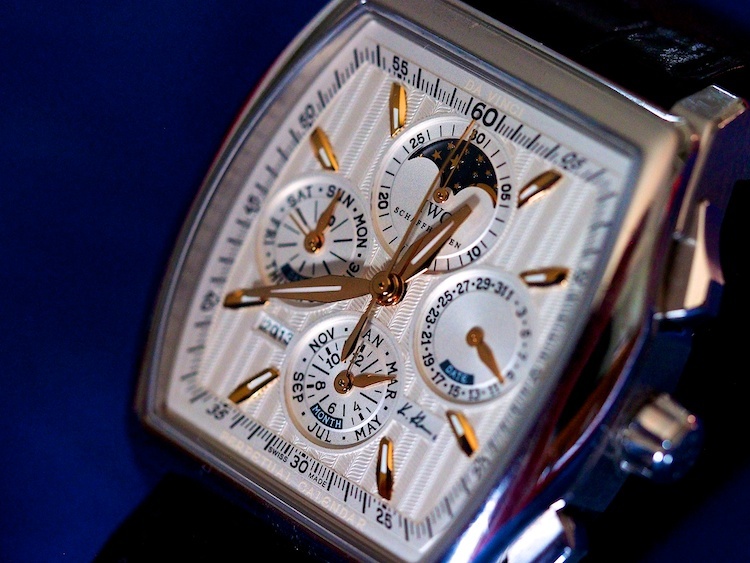 Many thanks to IWC for making this rare and unusual example of the 2007 Edition Kurt Klaus Perpetual Calendar Chronograph available for this article. A few pieces are still available from IWC of this significant piece of horological history. Offered in stainless steel at $24,000; for availability contact IWC; www.iwc.com.